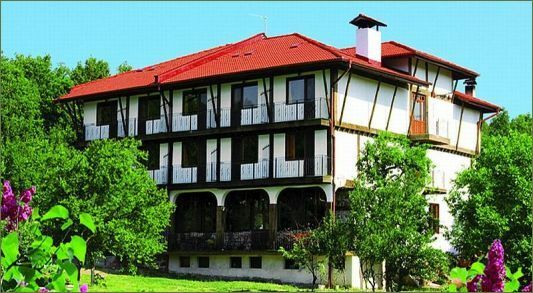 MADONA Inn is situated in Falkovets, just 14 kilometers from the town of Belogradchik, 52 kilometers from the municipality town Vidin and 170 kilometers from the capital Sofia. It is the place where the natural phenomenon Belogradchik rocks starts from. The exact coordinates are 43°N 35' 51'' and 22°E 46' 47''. The altitude is 266 meters. The inn offers two suites, six bedrooms, ten double rooms and one single room, all with separate bathrooms, TV sets and Wi-Fi Internet, as well as a conference room for 40 people. The restaurant has 60 seats, divided in two halls. During the summer season there are 20 more seats in the garden. There you can enjoy the delicious Bulgarian cuisine and unique Torlak specialties and judge the local wines and brandies on their merits. There is a 7-decare yard with facilities for guests with travel trailers (caravans) or campers. You have the great opportunity to practice alternative, biking, hiking and cave tourism, hunting and fishing, sport, kayaking and white- water rafting. You can visit the Belogradchik rocks, the Kale fortress, Magura cave, Baba Vida fortress, as well as numerous monasteries in Northwest Bulgaria.